Dr Jean Haxaire recalling, at IMYB 2018, how he found the Asian hornet in 2004. 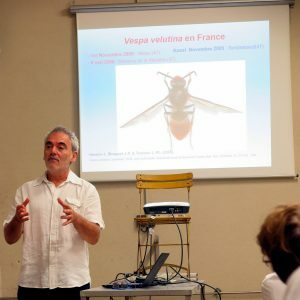 At the 2018 International Meeting of Young Beekeepers last week, adults in the group had the honour of meeting the man who first discovered the Asian hornet (Vespa velutina) in France and learning o an early missed opportunity. Dr Jean Haxaire, associate professor at the University of Agen, discovered an Asian hornet quite by chance in some fruit near Bordeaux in 2004. Immediately realising that this could be significant, he identified the strange insect as Vespa velutina and alarm bells in his head started ringing. He knew of the reputation of hornets in the Far East and therefore realised that this could be a serious threat to France. Dr Haxaire rapidly published an article in a scientific journal, but was very disappointed that reaction was muted and no-one seemed to want to take action. Sadly, his worst fears were to be realised as the hornet became established and within a couple of years its spread throughout France and beyond became unstoppable. If action had been earlier, there might have been some hope in preventing its spread, but now he says we must regard it as a native of France – even though it is an uninvited guest. Dr Haxaire is now certain that, as first thought, the intruder came in a consignment of bonsai plants. Genetics and trading patterns indicate with some certainty that it came into Bordeaux via Shanghai. The good news might be that at least velutina wasn’t one of its Far Eastern relatives that can be many times its size! The bad news is that it is an amazingly adaptable insect. With graphs showing how the demographics of a nest changes through the season, Haxaire emphasised the importance of destroying nests early in the autumn before foundress queens emerge. When they do appear, the problems of further spread become enormous. In France, the trigger date for the first emergence of the queens is usually around the end of September. The extent to which velutina predates on bees is strongly correlated with the environment – in cities, the predation is greatest because there are relatively fewer dietary alternatives to honey bees. Attending the IMYB event a few days later, Dr Benjamin Poirot a honey bee specialist from Apinov in La Rochelle said that the situation in France this year at the beginning of July is very serious. He says he has never seen so many Asian hornets so early in the year. And he should know – for the past several years he has frequently been called out to destroy nests when they are found.